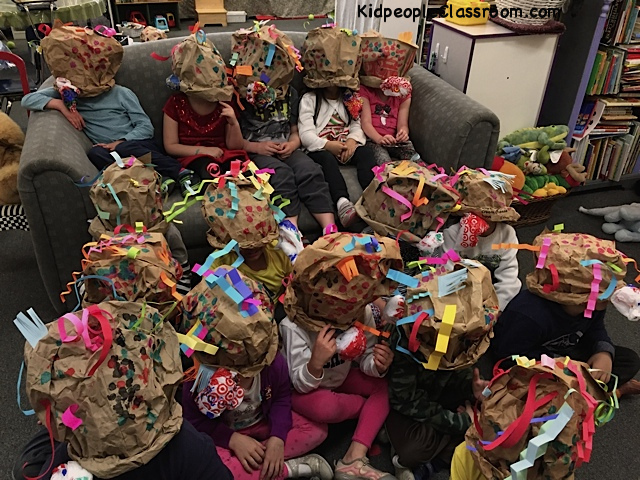 Kidpeople Classroom: Garden News, Review & Giveaway! It summed up that day... and many days that followed. 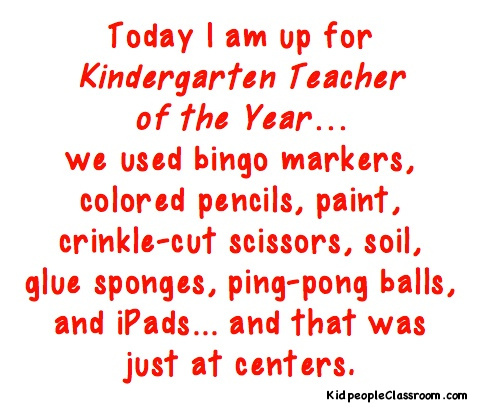 I LOVE kindergarten but I swear I spend as much time putting away as planning and getting out! 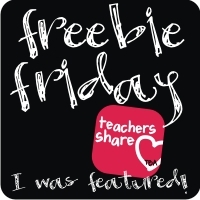 Thanks to Kacey for the Five for Friday linky– a super good way to find teacher bloggers! 2. Okay, so that image up above was my number 1. I'm a bit pooped as I work on this tonight. Ta-Da! 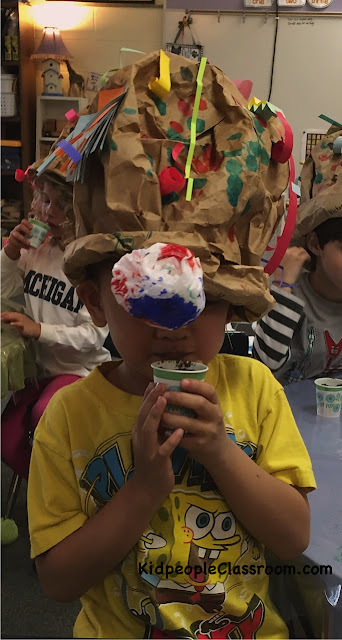 For those of you who follow, you'll know I had plans to make some Earth Day hats, and WE DID! This one's flower drooped to allow for incognito viewing. They are made entirely out of recycled-reused materials: brown paper grocery store bag, white plastic shopping bag, and scraps I collected over two weeks. In this up close and personal shot you can see we used bingo markers for added color. The rose is just the plastic bag, curled up and stapled, with added permanent marker color... yes, Target makes the best bags for this and OF COURSE I could come up with enough without even asking parents. 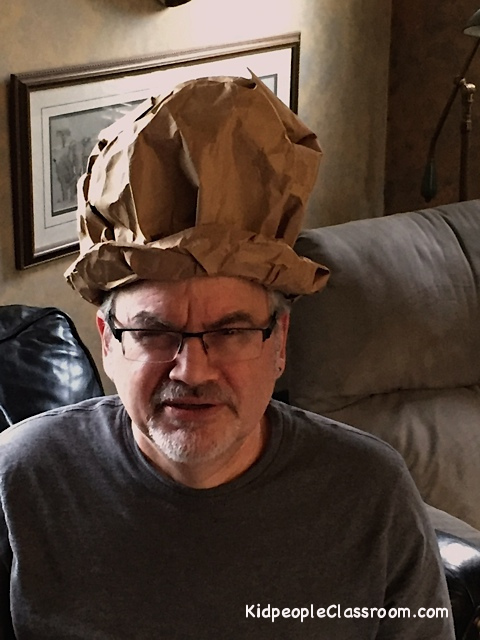 DH Jonathan (Dear Husband, not Dumb Head as he insists) helped me turn the grocery bags inside out so you couldn't see the branding, and after twenty he couldn't resist trying one on himself. My class looks like a bunch of Unknown Comics as we take a blog shot... I don't even know if the kids know what a "blog shot" is... but they know I don't want to see their faces if I ask for it. And I bet many of you are too young to even know who the Unknown Comic was! I'm telling you those hats were a BIG HIT. Not only with the kidpeople but people throughout the building. 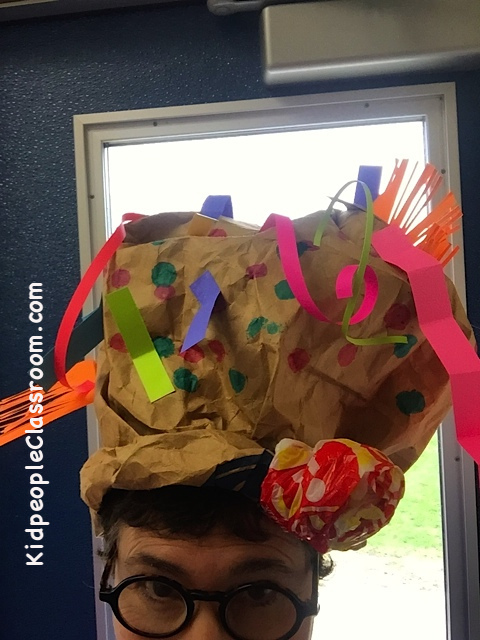 We did a parade through the fifth graders' room, and went Earth Day Caroling through the building boasting ... showing off ... sharing our hats. 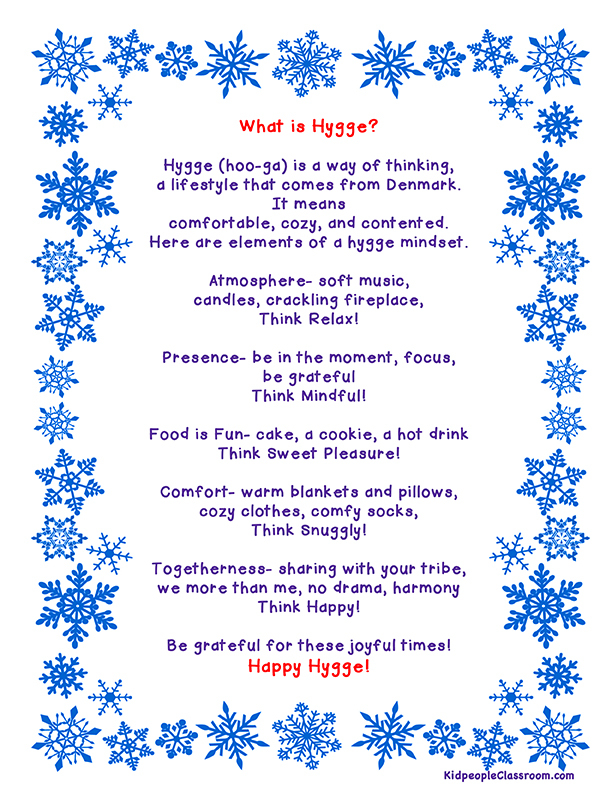 Our carol was the recycling song I posted about last week. 3. ... which leads to number 3, our dirt snack. Everyone knows about dirt pudding with gummy worms, right? Well, a made up a variation with these ingredients from the dollar store. I was inspired by all the gardening we've been doing in the new school garden, and thought Earth Day would be a great day to try it out. You can get EVERYTHING from the dollar store for under ten bucks. I crushed the sandwich cookies so that they looked like dirt and filled the cute flower cups with this "soil" almost to the top. Then I put out the sunflower seeds, edamame, nuts, and pumpkin seeds (which didn't make it into the picture.) 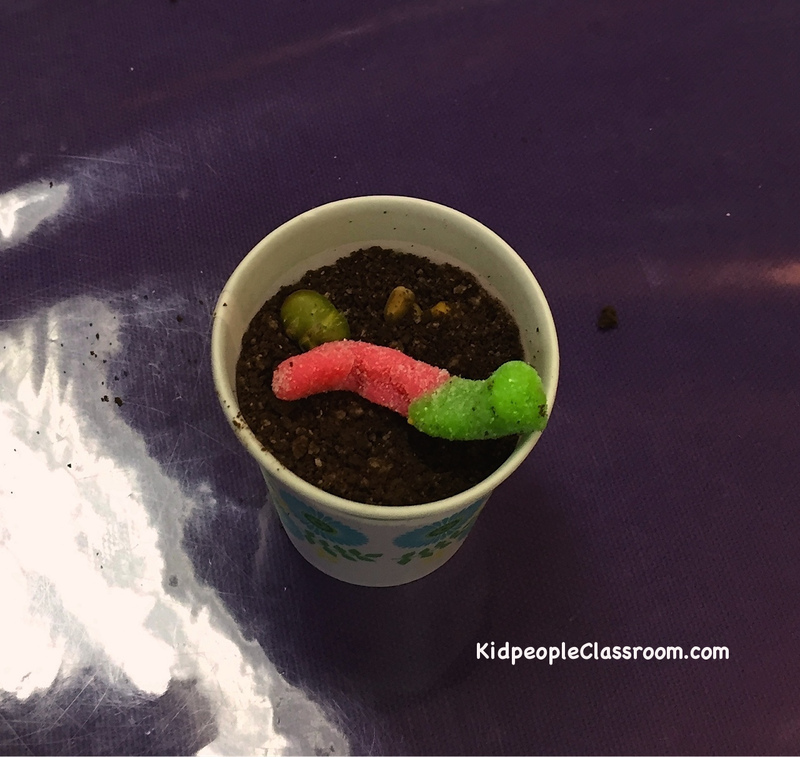 The kids poked their finger down in the crumbs to make holes in the dirt, then dropped in the seeds. Apparently some of them didn't realize that the dirt was cookies. When I said, "Go ahead, take a mouthful," and then did so myself, oh my, you should have seen their faces! One Little said, "Do we HAVE to eat it?? My mom won't let me eat dirt!" hmmm... how does he know this.... I assured them the "dirt" was cookies, and to convince them this was a fun treat, I handed out the gummy worms. 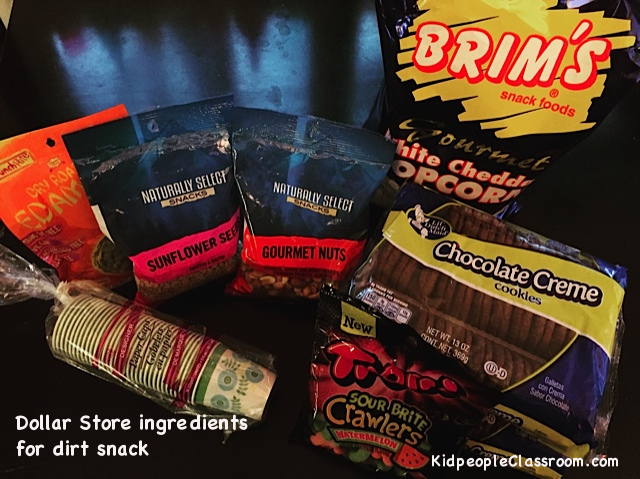 I meant to give out the popcorn, too, as it is another example of seeds we eat, but we were all so taken with what was in our cups that I forgot. We'll have to have it another day. I bet they'll hate that. I have to tell you, we had just been outside planting, with the kids poking their fingers in dirt to make holes for sunflower seeds, and this little made up treat did look an awful lot like those pots outside. As it turns out, sweet cookie crumbs with salty nuts and seeds are a great combo. Yum. The kids went off to special with dirt all over their faces, and when I got back I found I had walked around with crumbs all over my shirt... yikes. 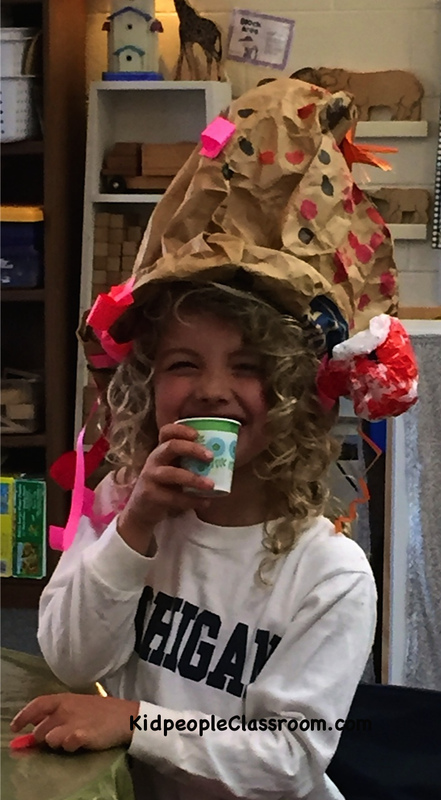 A GREAT Earth Day or Garden Day treat! I recommend you give it a try! 4. You can never go into the dollar store for two things without coming out with twenty... or at least I can't. Here are the other useful things I picked up, several of which I had never seen there before. 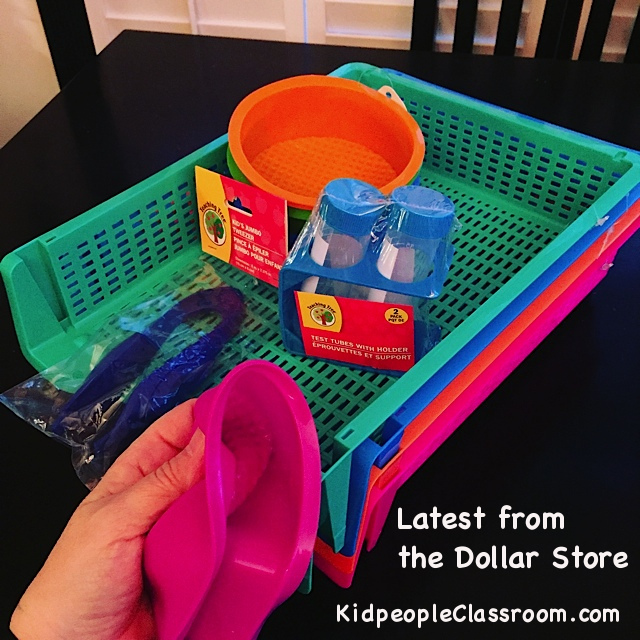 Stacking letter trays, kid tweezers that have a nice amount of tension- neither two tight nor too loose, plastic test tubes in holders– wouldn't they be cute with planted seeds so you could see the roots, and silicone dishes– squishy as I show here. Might be good for sand cakes... and yes, I really mean SAND cakes.... as in PRETEND, IN-THE-SANDBOX sand cakes.... only one dirt recipe per post. snort. 5. AND finally, a GIVEAWAY, the second in a series of three four! Yep, I have yet another one lined up for June. 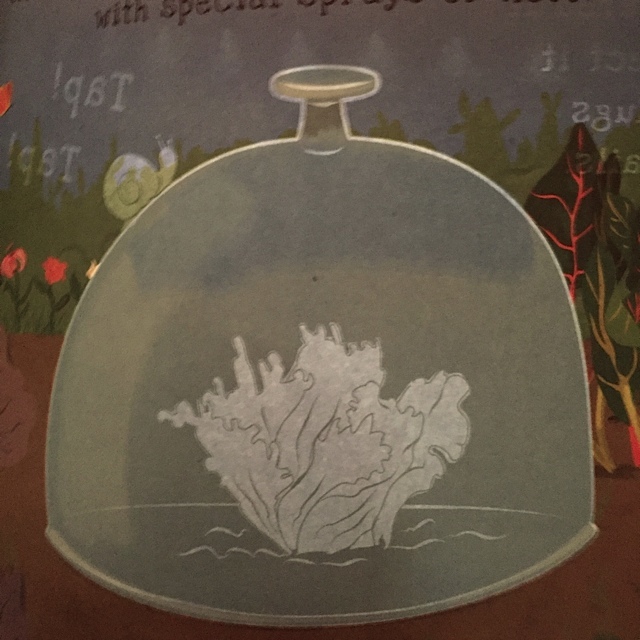 This week's giveaway is another book... but not just "another" book, a very unique book about gardens no less. 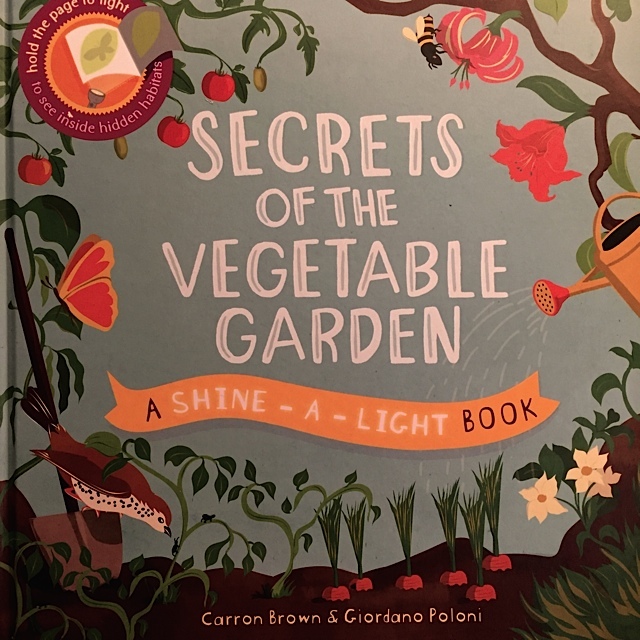 Secrets of the Vegetable Garden by Carron Brown and Giordano Poloni. 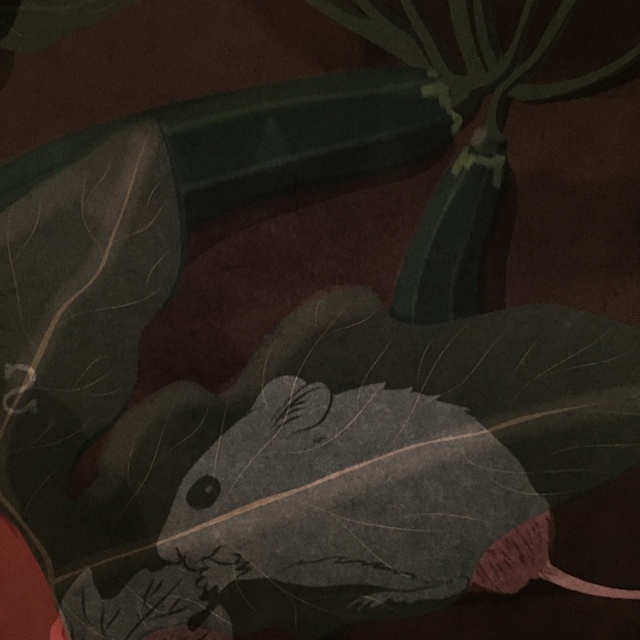 that you see when you hold the illustration up to the light. See? Kids will love holding a flashlight to the pictures. In class I used the lamp on my document camera. They LOVED it! Every page was another surprise. I had to read it several times so we could get all the details. And I got a special pleasure out of seeing my kiddos enjoy such low tech book happiness with no screens involved. Funny how the novelty of seeing through the paper held such interest. Don't get me wrong, screens have good purpose, but so do books... and flashlights. 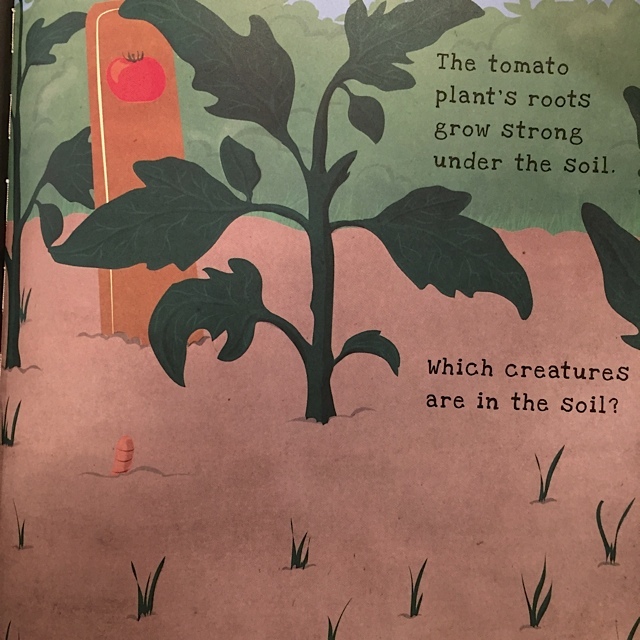 Secrets of the Vegetable Garden has all the facts needed to learn about plants. 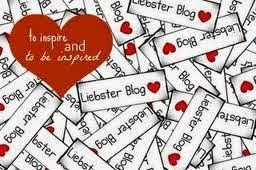 It can easily be read at spring planting time or autumn harvest. 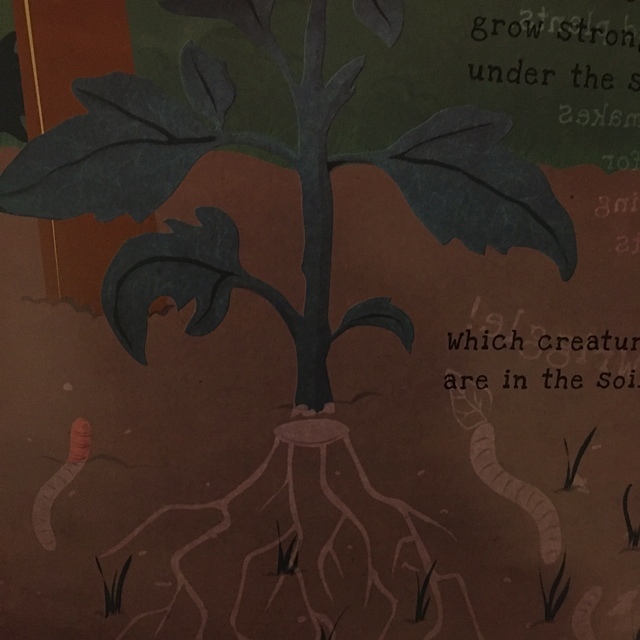 It has some rather unique gardening information, too. Lots of children, adults, too, don't know what a cloche is. Pronounced klōSH it protects plants from creatures like snails and slugs, but it can also hurry up plant growth. I have used one in the classroom as the greenhouse effect works beautifully, and I find them beautiful to look at as well. 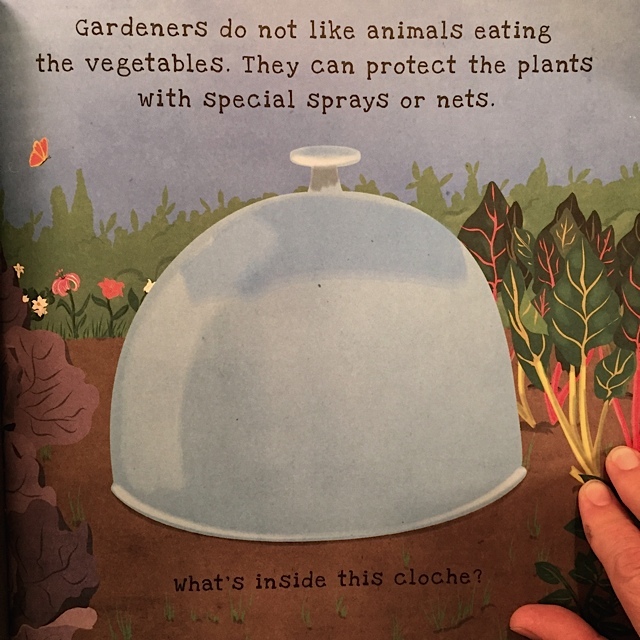 You're not going to find a cloche in every children's book. 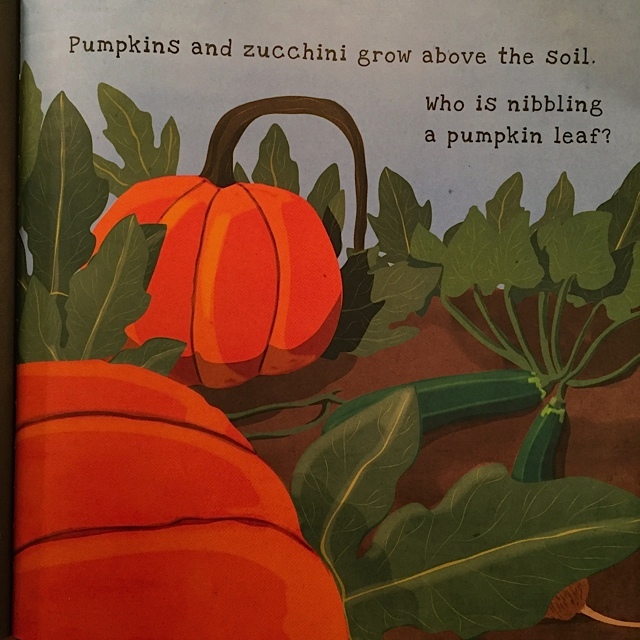 Thanks goes to Candice Currie, an independent consultant with Usborne Books and More for supplying Secrets of the Garden for the giveaway. Usborne Books and More is a wonderful book company that specializes in non-commercial, engaging, and educational books for children of all ages. 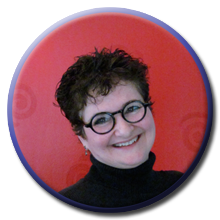 As an independent consultant Candice shares these books through home parties, online parties, fundraisers, book drives, and book fairs. 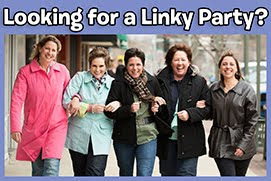 For more information you can contact Candice at CandiceMCurrie@gmail.com or on Facebook here. 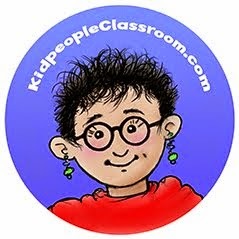 You can also see the great selection of books by clicking here. There are some terrific books I have to say. 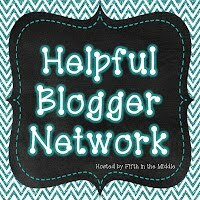 All you have to do to enter the giveaway is follow my blog via Bloglovin' or Email, both of which you can do with a click to the right sidebar over there. I'll find your name and email address to verify. You do want to follow so you don't miss anything, like this book and the next giveaway I'm doing of a HUE camera and animation kit! 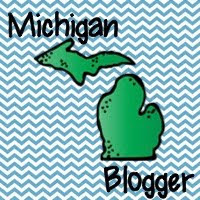 More info coming on that SOON! Now click away and get into things below and I might just be dropping Secrets of the Garden in the mail to YOU! 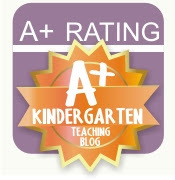 Hope you enjoyed today's review of life in the classroom and a great book. 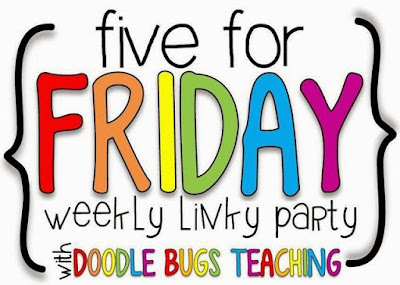 Now it's time to click on over to Doodle Bugs Teaching Five for Friday to enjoy a little more teacher reading. Thanks for stopping by! Don't forget to enter! See you next time! Love the hats! I'm sure they had a blast parading and caroling around the school!